After taking last week off from writing, I want to jump back in on our monitor console transition which is still ongoing. When I left off on this a couple months ago, we had just installed the first of our new consoles in our east auditorium. In the time since that post, we had a wrinkle in getting the west auditorium console in when I originally planned, but we did a bit of a makeshift installation at the end of March and we’re now on track for completion by the end of April. The transition thus far has been pretty good but not without some bumps which were expected. We’re shifting a team of seven guys into gear they were mostly unfamiliar with. 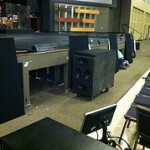 We’ve had the east console in for about 9 weeks now and the west console just finished week 3. Adding the second console to the mix accelerated the transition a bit, but it’s still taking time. Just based on the way crew availability has gone, I still have guys who haven’t had their first full week on the new console and some of the guys are only on their second run at it. Considering how limited much of our crew’s exposure has been on the desks, I think we’re in really good shape. I mentioned in February that we had some strategies to set ourselves up for success in the transition. So I figured I’d take the rest of this post to talk about some of those. Let’s say we have a guitarist named Nigel. The first thing our monitor engineers would do to pre-dial is set Nigel’s guitar input’s aux send at unity for Nigel’s monitor mix. The next step is to set that guitar input’s aux send around -10 to -15 dB to the rest of the band. 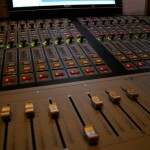 Then our engineers set panning in each mix. Nigel’s guitar is panned center to himself in his mix, but since Nigel is standing stage right his guitar gets panned a little to the right in everyone else’s mix. This would complete the pre-dial of Nigel’s guitar, and the process would be repeated with the rest of the inputs for the week. When Nigel arrives to setup his gear or else when soundcheck starts and gets around to him, the monitor engineer adjusts the input gain to get Nigel’s guitar good to himself which in turn ballparks him in everyone else’s mix. So the idea behind pre-dialing this way is when Nigel gets up on stage he will start with a mix that has his guitar 10-15 dB louder than the rest of the band with the rest of the instruments panned in his mix relative to where he’s standing on stage. 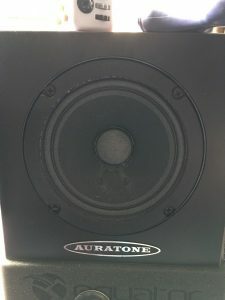 Beyond the pre-dial, the rest of the mix changes come down to each musician’s personal needs and tastes, and these can be very different depending on player and position on stage. But that’s OK because the point of pre-dialing isn’t to have everything perfect before anyone starts playing. Pre-dialing simply helps get everyone in the ballpark, and most importantly it establishes each musician as the loudest thing in their mix from the beginning so they always have enough of themselves. More Me requests beyond this point are often an indicator of something else being out of whack in a mix so that it becomes a matter of turning other instruments down instead of turning someone up to themselves. With the VENUE, pre-dialing is greatly simplified because 95% of the pre-mix is built into the template we use every week. 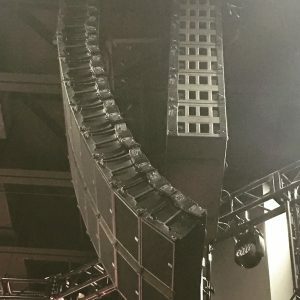 Everything pre-dialed beyond the template really comes from our monitor engineers’ familiarity with specific asks our regular musicians give them along with personal mixing style tweaks. Another strategies I used before transitioning to the new console was to build our monitor template from an old FOH show file. The benefit of doing this was I had real audio from the multitracks recorded on Sunday to use. Since the VENUE allows you to apply gain changes back to the pre-amps while using virtual soundcheck, I was able to pop in my IEM’s and tweak the gain settings a bit to optimize them more from a monitor mix perspective. 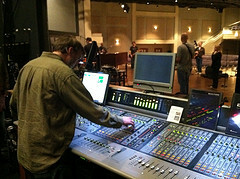 The result was we were VERY close when we did our first soundcheck on the new console. As we moved forward on the transition, I was then able to propagate some new settings into following weeks as our template has been slowly tweaked. Something I did early on that helped with this was to create a “Pre-Dial” snapshot. The advantage of the snapshot is that after a week of mixing, I can selectively recall certain pre-dial settings such as channel names, aux-send levels, aux-send pans, etc., while retaining things like mic-pre settings from the previous week. So, for example, we can go back to a pre-dial while leaving in improved gain settings for our drum mics. Taking this a step further, something else I’ve been experimenting with is building a preset library of each of our musicians with their settings to themselves so that when they come in and check their instrument level to themselves it’s a pretty quick line check. The end goal in all of this is really to help get our musicians their killer mix as quickly as possible. 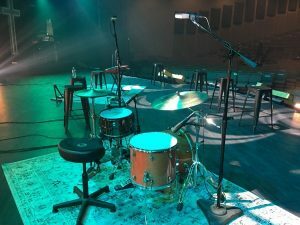 While soundcheck is a very necessary thing, the reality is that most musicians don’t enjoy it when it’s long and drawn out. Our soundchecks are essentially jam sessions for the band so when they go too long, the well starts to run dry which can adversely affect what happens during rehearsal. However, if we can keep soundchecks tighter, they can actually serve to inspire and energize the band’s creativity. When the band has a good time during soundcheck, it tends to carry over into rehearsals and what the band brings to the actual songs we’re doing. While pre-dialing is definitely a help in speeding up our process, the interesting thing about switching to VENUE is I’m not sure how much this will ultimately matter down the road. I’ve been watching our guys over the last few months and something I notice is that every time they get behind the VENUE they get faster. In some ways they can move even faster than they did on the analog consoles. It’s going to be very interesting to me to see how fast they can really fly on these desks once the geography is second nature. Every week I see more and more of our musicians simply ask our monitor engineers to dial up their mixes without making specific requests. And this is all happening on consoles that these guys have spent relatively little time on. So I guess right now you could say I’m still pretty happy with our investment in the VENUE. But more than that, I’m really proud of our volunteer monitor engineers and how they’ve stepped up their game in this transition. I can’t believe how blessed I am to work with these guys. (1) Does that method of pre-dialing work well for wedges or is it such a different animal that one would invite trouble? 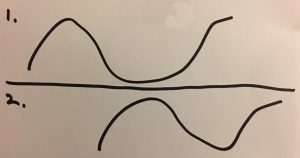 (2) How far down is the input gain when you start and does the Input signal end up around unity? I have been told that you want a lot of gain on the input to get a good A/D conversion. Maybe it doesn’t matter as much for in-ears. You could pre-dial for wedges, but it would be a bit different depending on how many acoustic sources are on stage. At a minimum, I would go out on stage with vocal mics and talk into them and get a rough starting point for them. Input signals probably peak around or just above 0 VU on the VENUE which is around -20 dBFS on a digital full-scale meter. I believe that running gains “hot” with digital gear is a myth. Most digital gear these days is calibrated so that -18 or -20 dBFS = 0 VU in analog gear. In my opinion, that 0 VU level remains optimum for input levels.